Q. 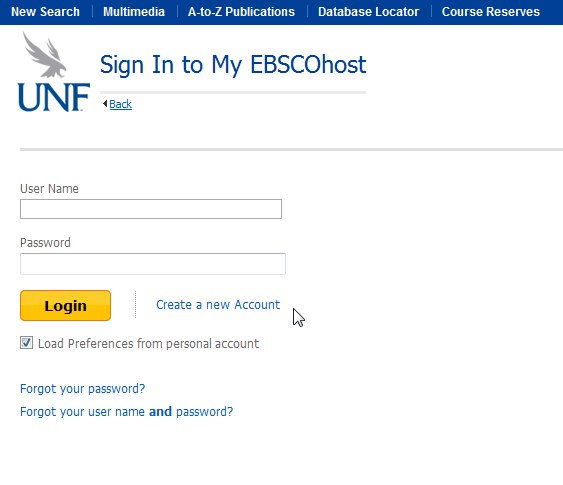 How do I open an EBSCOhost (aka "my ebsco" account)? From any Ebsco database, including OneSearch, look for the "sign in" usually near the top right of the page. Click that link then on the new page, click the link that says "Create a new Account" (see below). Now you can enter your info* and create the account. This log in will be the same across any Ebsco databases and OneSearch. *Note: Your Ebsco account does not alredy exist in any way (unless you have previously created one) and is not tied to your N# so you can enter any username or email you would like to use.